Ideas about how to use everyday things in new ways! Please comment and share your ideas, experiences or other information about how you've adapted products in new ways. We could not control conditions in the hospital but I was determined that when she got home we would use technology as much as possible to allow her to have more control and comfort. We met with recommended vendors who would come by to speak to us about equipment for the disabled. However, we were shocked by how much it cost. When we would question why it cost tens of thousands of dollars to do something simple, such as unlock a door, we were told it was because it was special, customized and required the ongoing support of the company. There was also the further stigma of having to use something that didn’t work the way normal things worked. For Suria, she didn’t want someone who was a guest to have to learn to use her “customized” equipment. For example, the guest could not pick up a regular remote to change the channel or open the door normally. They would have to use special “switches”. She wanted the guest to still be able to enjoy the house without special instructions. Skip ahead several months and by using functions built into regular consumer electronics we were able to overcome many of her challenges. Suria would pose the “what if” and I would try to find ways to do it. The first time we had visitors over and Suria turned to the television and said, “Xbox on” and the television turned on, our guests were shocked. When she said, “Xbox watch NBC”, and the TiVo switched to Grimm on NBC the first thing our gusts said was, “I want that!” I remember Suria beaming like the kid on the block who got the new toy first. It was that feeling we wanted to share when we started SunKirb Ideas. So, in this blog site we will highlight technology that is affordable and can be adapted. The first of these is the closest thing I’ve experienced to the computer on Star Trek. First up is the Amazon Echo. 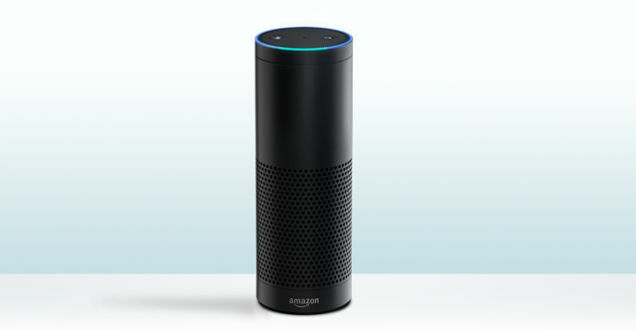 Amazon Echo is a voice command device disguised as a speaker and is sold by Amazon.com. It has no screen. All control is performed by speaking an activations word (in this case “Alexa” or “Amazon”) and your request. Overtime we have just started referring to the unit as Alexa. Echo’s functions include answering questions, playing music and controlling smart devices. The device is a 9.25-inch tall cylinder speaker with a seven piece Microphone array (Translation: It hears really well) and speakers that include a woofer and tweeter (the sound is very clear for a small speaker). It must be plugged in and requires Wi-Fi. Also, it requires an amazon account and smart phone/device to setup and get all the benefits such as integration to Pandora, iHeartRadio, Prime Music, your calendars, to-do lists and shopping lists. There is no monthly charge for the service. Echo is also an excellent Bluetooth speaker. When speaking to it, to let you know it is listening, a small blue ring lights up at the tops when you say “Alexa”. You can substitute the word “Amazon” but so far these are the only two names you can use. Once you make your request the rings will pulse to show it is thinking and then it will verbally respond to you. It is the response that can be amazing. Instead of showing text like Siri on the iPhone it actually provides a verbal response. Some people have asked is it smarter than Siri or Cortana (Microsoft’s voice activated assistant now on Windows 10). The answer is no. However, it is more natural. Since it is always on, and remains in a stationary place in the room you choose, such as the living room, it is the closest to feeling like a true assistant. When cooking, I can ask it to convert gallons to ounces without grabbing my phone or a computer. Most people are prepared to compare or write off the $179.99 Echo as another Siri. However, talking to Alexa, the voice behind the Echo, immediately feels more natural and organic than other forms of voice control I've tried. I can say “Alexa, what’s the weather?” or “Alexa, how’s the weather?” or “Alexa, what’s it like outside?” and Alexa will give me a full weather report in an almost natural tone. I can ask “Alexa, Wikipedia who was Benjamin Franklin?” and Alexa will begin to give me the short history of Franklin. When Alexa stops I can say “Alexa, tell me more” and Alexa will give me more detailed history, where “she” left off. Alexa can be told to set alarms and countdown timers, play music from my specific Pandora playlists, provide a traffic report, order from Amazon, give me the news or even tell me my next appointment. When I go in the refrigerator and find I am out of milk I can say “Alexa, add milk to my shopping list” and when I go to the Echo app on my phone the milk is on my shopping list. When used in the context of adaptive technology these functions are incredibly useful for those who do not have the use of their hands, are bedridden, or blind. What is more exciting is the fact that Echo is compatible with many of the smart-home device that are currently available. Primarily Echo, when paired with these devices can control lights and power off/on plugged-in devices. So, for my wife, she can control the lights in the house verbally. I recently rigged a bell to a Belkin WeMo switch and now my wife can say “Alexa, turn on the bell” and it will ring throughout the house if she needs immediate help when I’m on another floor in the house. For home care with people that are bedridden this could be very useful. For those of us who have purchased the Echo the joke is “bet you can’t buy just one.” One week after testing our Echo in the living room my wife asked for one in her bedroom. Shortly after that I purchased one for my office. Give me feedback or questions and I will be happy to provide you with more information on the Amazon Echo.